RenewEd: Afraid of technology? Rupert isn't! For over 40 years, ABC Radio has presented the Boyer Lectures, a series of talks by prominent Aussies on a wide range of hot topics. 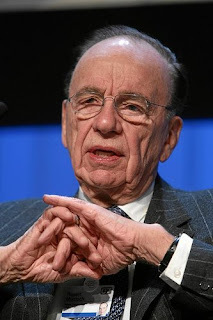 Rupert Murdoch is t he 2008 Boyer Lecturer, and he's been talking a lot of sense over the past couple of weeks. Last Sunday, his lecture was titled "Who's afraid of new technology?" (listen here). His comments are consistent with the current situation in many educational institutions, where too many teachers are spending time criticising new technologies, rather than embracing them. In the words of Rupert, "whinging about the technology will get you nowhere. The only way to deal with new technology that up-ends your job or your business model is to get out in front of it. Otherwise it will get out in front of you." He goes on to say that "in the future, successful workers will be those who embrace a lifetime of learning. Those who don't will be left behind." How can we expect our students to thrive, if teachers remain stuck in their old ways? As this self-confessed Digital Immigrant tells us, it's time for change! I'm looking forward to his lecture on 23 November when he'll speak about the need for reform in Australia's education system. He is sure to expand on his view that "we need teachers who inspire—not those who conspire to thwart change." Wow thank you for sharing this. Some great insight Rupert said there and hope you can also blog about what he'll share on the 23rd. Thanks for the comment, Janet. Yes, I'll be listening on Sunday, and summarising his lecture right here!